Bangour Village Hospital has to be one of the most atmospheric places in Scotland: though at times the atmosphere is not entirely comfortable, and can border on distinctly spooky. Large numbers of very imposing and increasingly derelict buildings are dotted around an overgrown 960 acre site on a south facing slope, just to the north of the M8 motorway and the A89, and three miles north of the centre of Livingston. Today this huge area is all but abandoned, and as you walk round the (reputedly) four miles of roads on the site, the only people you are likely to meet are dog walkers and the occasional white van on security patrol. Signs of decay are everywhere: but it was a sign of a different sort that left the deepest impression on us. One of the villas towards the south east corner of the site carries graffiti applied in red paint: "MY MUM PUT ME HERE!" What makes this so chilling is the knowledge that for a century this vast complex of buildings served as a mental hospital, and you cannot help but wonder about the human story behind the graffiti: and then realise that it was just one of many thousands of individual human stories that would have been played out here during the hospital's active life. A villa in a mental hospital? In 1902 the Edinburgh District Lunacy Board purchased the 960 acre Bangour Estate. The aim was to build what for Scotland would be a new kind of mental hospital based on the "Continental Colony" system. This new system had been developed at Alt-Scherbitz, near Leipzig, which members of the Lunacy Board had visited in 1897. The aim was to give patients a positive and pleasant environment by building a series of widely spaced "villas" in which patients would be housed, with other buildings providing central services. Patients would receive a range of therapies, but were also expected to benefit from the rural setting and the opportunities to work in the grounds, in workshops, and on the neighbouring farm. The competition the Board launched to design the hospital was won by Edinburgh-based architect Hippolyte Blanc, and many of the buildings you see on the site today are those he originally designed. Thirteen of the hospital's buildings are "Category A Listed", and so have the highest level of statutory protection: though this is of course protection from the hand of man, and not necessarily from the effects of the weather and the passage of time. Blanc's work at Bangour has been variously described as "Queen Anne" or "17th Century Scottish Renaissance" in style. He certainly succeeded in bringing a sense of architectural flair to the hospital, though in many ways the single unifying characteristic is just how different every building appears to be from every other building, even where the functions were the same. This at least allowed later buildings to be added to the hospital without looking out of place. Bangour Village Hospital was formally opened on 13 October 1906 by the Rt Hon The Earl of Rosebery, Lord Lieutenant of Linlithgowshire, though the first patients were moved in during 1904 and up to 200 were in residence by the end of 1905. Among the most important elements of the hospital built to Blanc's designs were the imposing nurse's home and nearby hospital block in the site's north east corner, and most of the more than 30 villas. As each villa housed around 30 patients you get a clear idea of the size of the hospital in human terms. One of the most striking buildings on the site is the Village Church. 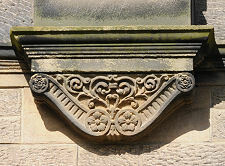 This was a later addition, built between 1924 and 1930 to a design by H. O. Tarbolton. It is said to be the largest church built in the Lothians outside Edinburgh during the 1900s and occupies a focal position from where it dominates the eastern half of the site. 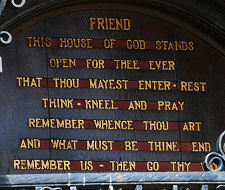 There is a certain irony in the inscription above the church door, visible beyond the securely padlocked metal screen preventing access to the doorway. This begins: "Friend, this house of God stands open for thee ever, that thou may enter, rest, think, kneel and pray..." Other later additions included some of the villas in the more exposed and less landscaped western end of the site: and the sports pavilion overlooking the extremely large sports ground. Meanwhile one building is said to have moved location entirely during the hospital's life: a wooden structure near the centre of the village is reputed to have previously served elsewhere on the site as the hospital's railway station. A railway line had been built from Uphall Station to help with the construction of the hospital, and this continued to provide a passenger service until the end of World War One. The hospital had only been in use for a decade when it was overtaken by world events. In 1915 it was requisitioned for military use, and with the addition of temporary accommodation marquees was housing over 3,000 wounded servicemen by 1918: meanwhile the mentally ill patients were displaced to asylums around Scotland. Bangour Village Hospital reopened as a mental hospital in 1922 and it was to mark its reopening and to serve as a war memorial that the Village Church was commissioned. 1939 saw the use change again, when Bangour became the Edinburgh War Hospital. This time its capacity was increased by the building of a large annex on a site to the north west. 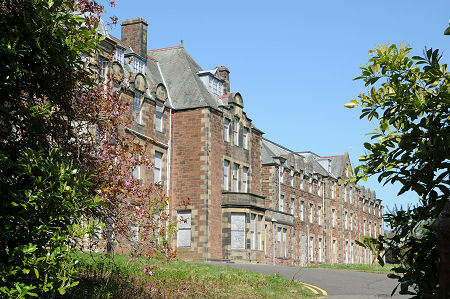 After the war the annex became Bangour General Hospital, offering general medical services across West Lothian, while Bangour Village Hospital again reverted to use as a mental hospital. Bangour General Hospital was run down and closed (and subsequently demolished) following the opening of St John's Hospital in nearby Livingston in 1989. Meanwhile the wider approach to mental health was changing, with advances in medication and an increasing emphasis on "care in the community" leading to the run down and closure of many traditional mental hospitals. This process ran its course at Bangour through the 1990s and into the early years of the current century, and the last patients left the hospital in 2004, almost exactly a century after the first arrived. The following year the site was used as the location for the film "The Jacket", starring Keira Knightley and Adrian Brody. Since then it has been in the news as the subject of planning interest for development as housing, incorporating all the listed buildings on the site, and as a location for police riot training: and for a while the local press were reporting the possibility that it might become an Islamic university, though like the proposed housing development this came to nothing. Let us hope that a good use can be found for this remarkable site that restores the listed buildings before they decay much further; that preserves public access to an important but little known part of our heritage; and that helps keep alive the memory of all those who spent time here as patients during Bangour Village Hospital's century of active use, including whoever it was who wanted the world to know that their mum put them here.